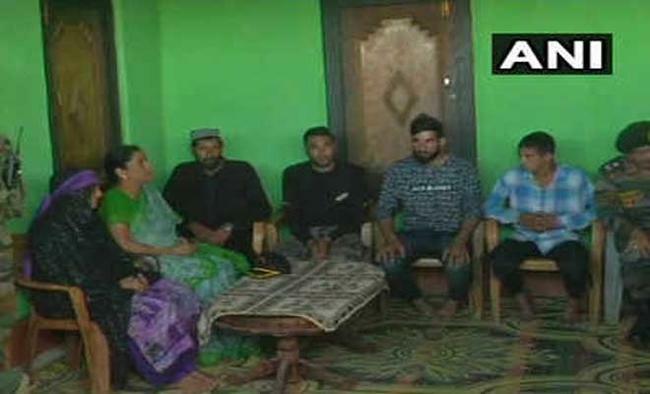 Jammu: Defence Minister Nirmala Sitharaman on Wednesday visited the family of rifleman Aurangzeb who was abducted and killed by militants in Jammu and Kashmir on June 15.Sitharaman arrived here earlier in the day and flew to the Mendhar area of Rajouri district where she met the bereaved family. "I have come to spend some time with the family of the martyr and the message I am carrying back is that the martyred soldier stands out as an inspiration for the entire country," the Minister told mediapersons here.The slain soldier's father has also served in the Army.Army chief General Bipin Rawat also visited the family on Monday.Aurangzeb was brutally killed in Pulwama district in the Kashmir Valley. He was on way to join his family on the occasion of Eid when the militants intercepted the private vehicle in which the soldier was travelling to Shopian town, from where he would take another vehicle for Poonch.A video released by the militant group that abducted Aurangzeb showed him bravely acknowledging that he was a soldier of the Indian Army and had participated in anti-militancy operations in south Kashmir.